Your stag do is your ultimate last night of freedom, the last time to really let loose and most importantly, one of the best nights you and the guys will ever have out – no pressure. With this in mind, don’t just stay safe and go down to your local pub for a few pints, do something cool and different! 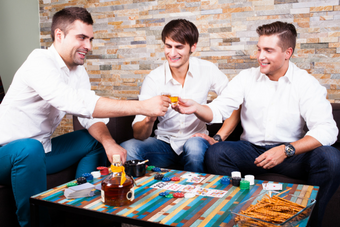 Stray away from the crowed with these different stag do ideas that will give you awesome lasting memories. Like best man favours, a stag do favour can be a really quirky idea that will set your stag do apart from the rest – plus it might be a laugh. This is one of the easiest different stag do ideas, and can be done with one or a few things that are personal to your friendship group. Whether your favour is a play on some inside joke, a memento of your favourite place or just some mini bottles of your mate’s favourite beer, it’s the thought the counts with stag do favours. Seen as you only have one stag do in a lifetime (hopefully), it’s important to make the most of it. What easier way to do that than treating you and the lads to a stag do package? A full weekend away, in the city of your choice, with activities you want and accommodation all sorted for you, no stress needed! Packages mean you can cram loads of experiences you’ve always wanted to try into one weekend, so if you’ve ever wanted to surf along the Swansea coast and grab a few beers, now’s your chance. On top of all that, your groom to be will nab himself a free space with our stag goes free on all packages offer. This counts towards all accommodation packages, including the build your own weekends so you have total control without any of the stress.